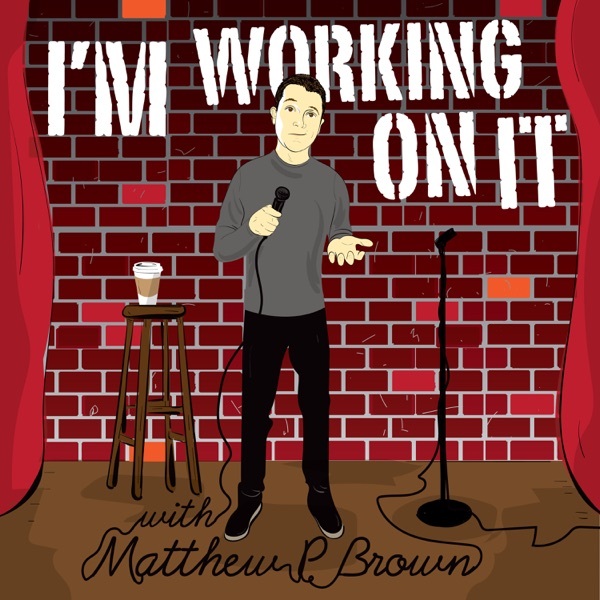 I'm Working On It With Matthew P Brown | Listen Free on Castbox. Matthew talks about performing at The Comedy Store, the Ice House and other recent shows. Matthew talks about taking steps to help with depression and his experience with anxiety and OCD. He also talks about having fun traveling to shows and great experiences from the last couple of weeks! Matthew P Brown Instagram|@MattPBrown www.matthewpbrown.com Subscribe on iTunes! Rate and Review! Comedian Ry Doon returns to the Podcast with Matthew P Brown. Matthew and Ry talk about Ry's upcoming tour with Nicholas Megalis, Ry living in a mobile home, life, creating happiness, working hard at your dreams and much more! Matthew P Brown Instagram|MattPBrown www.matthewpbrown.com support the Pod! paypal.me/MatthewPBrown Ry Doon Instagram|Ry Doon Tour info: www.nicholasmegalisisnotfunny.com Subscribe on iTunes! Rate and Review! Matthew P Brown talks about traveling across the country, seeing all the different States and following your dreams. Matthew also announces whats to come with the Podcast in 2019! Comedian:Matthew P Brown Instagram|@MattPBrown www.matthewpbrown.com Subscribe: Rate and Review on iTunes! Available on all formats! #82-Matthew P Brown "Traveling Across the Country"
Matthew talks about a crazy show where he recently performed, "meeting Alanis Morissette", weird encounters with people in public, how it takes courage to be your self and how its important to keep working on what it is you are doing, and he talks about so much more. Enjoy! #81-Matthew P Brown "Be You"
Episode 80! Matthew talks about his rumors with Ryan Seacrest, Bumping Mics Special with Jeff Roos and Dave Attell, being the best version of your self, waking up so early you can't brush your teeth, losing your mind at work, what "Scoot Fest" is and so much more! Comedian: Matthew P Brown Instagram|@MattPBrown www.matthewpbrown.com Subscribe! Rate and Review on iTunes! #80-Matthew P Brown "Scoot Fest"
Matthew brings the energy in this one. Talking about opera singing in elementary school, getting punched in the face and losing a tooth, seeing a teachers underwear, Adam Sandlers Special, how it is important to be in tough situations, "making the world better", getting embarrassed, seeing Mid 90's, and so much more. #79-Matthew P Brown "Face Punch and Being Human"
#78-Matthew P Brown "Laughter is Medicine"